Rockledge, FL (April 28, 2017) - SeaDek Marine Products, the industry-leading manufacturer of EVA non-skid products, has been named a contributor of SoftBank Team Japan in their campaign for the 35th America's Cup. Their innovative decking surfaces will be utilized on the team's America's Cup Class Yacht, a nearly 50 foot foiling catamaran, as well as other applications to provide exceptional traction for the crew and support staff. After a 15-year hiatus, Japan's return to America's Cup sailing marks a new chapter for the team. Led by skipper and CEO Dean Barker, the team established a base in Bermuda at the Royal Naval Dockyard in 2015 in preparation for the Louis Vuitton America's Cup Challenger series starting on May 26, 2017. SeaDek's products are an invaluable addition to the fleet thanks to advanced non-skid characteristics that enable the sailors to safely maintain contact with the boat in the extreme conditions that define America's Cup sailing. 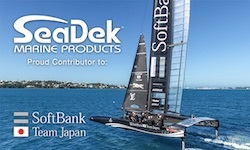 "We are thrilled to be contributing to SoftBank Team Japan in their bid for the America's Cup," said Jason Gardner, vice president of marketing and advertising at SeaDek. "With so much advanced technology going into the design and construction of these boats, we are honored to stand alongside the best in the industry to support the team." Learn more about SoftBank Team Japan at http://softbank-team-japan.americascup.com/.